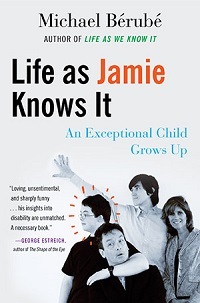 Published in 1996, Life as We Know It introduced Jamie Berube to the world as a sweet, bright, gregarious little boy who loves the Beatles, pizza, and making lists. When he is asked in his preschool class what he would like to be when he grows up, he responds with one word: big. At four, he is like many kids his age, but his Down syndrome prevents most people from seeing him as anything but disabled. Twenty years later, Jamie is no longer little, though he still jams to the Beatles, eats pizza, and makes endless lists of everything—from the sixty-seven counties of Pennsylvania (in alphabetical order, from memory) to the various opponents of the wrestler known as the Undertaker. In Life as Jamie Knows It, Michael Berube chronicles his son’s journey to adulthood and his growing curiosity and engagement with the world. Writing as both a disability studies scholar and a father, he follows Jamie through his social and academic experiences in school, his evolving relationships with his parents and brother, Nick, his encounters with illness, and the complexities of entering the workforce with a disability. As Jamie matures, his parents acknowledge his entitlement to a personal sense of independence, whether that means riding the bus home from work on his own, taking himself to a Yankees game, or deciding which parts of his story are solely his to share. With a combination of stirring memoir and sharp intellectual inquiry, Berube tangles with bioethicists, politicians, philosophers, and anyone else who sees disability as an impediment to a life worth living. Far more than the story of an exceptional child growing up to be “big,” Life as Jamie Knows It challenges us to rethink how we approach disability and is a passionate call for moving toward a more just, more inclusive society.